These two transplants passed on their recipe for roasted kale and inspired me to start my own little backyard raised veg bed last summer. I bet their story will get you excited about planting your own food too, whether or not you’re a budding urban farmer or suburban gardener. What, a post on growing a row in December? Hey, we live in the balmy Bay Area. We pulled up the last of the tomato plants on Saturday, went to the beach on Sunday (glorious day, no fog, I swear), and picked up sweet strawberries from the farmers’ market today. We’ve had a typically warm fall, but no need for folks in other parts of the country to turn green with envy; the relentless sunshine (honestly, it can be exhausting ensuring you enjoy the good weather all the time) will likely end soon. Indeed, rain is expected this weekend and that stuff makes us Left Coasters go running for cover. Regardless, whether you’re keen to put in a winter crop or live somewhere where seed catalogs are the only thing sprouting until spring, these folks have learned a thing or two about growing their own grub and they’re willing to share the wealth. The couple had dabbled in gardening at previous university pit stops around the country but once they landed in California they decided to get serious about growing greens. When they bought a home of their own two years ago in sunny South Berkeley, a large concrete area out back begged to be torn up and turned into an edible oasis. So that’s just what they did. Michael dug out concrete, put up fences, and amended soil. They solicited the help of professional gardening friend Andrea Hurd, who was keen to design a permaculture food forest but hadn’t yet convinced any clients to let her loose in their backyard. Leigh and Michael had no such reservations. The result? More of an overgrown playground filled with edible finds and less of a traditional vegetable patch of tidy rows. Just my kind of food garden: A recent tour reveals enough pumpkins to carve for Halloween and plenty left over to make soup at Thanksgiving. We pick the last of the green zebra tomatoes; the kids promptly devour them. Snipped sprigs of lemon verbena will find their way into simple syrup for cocktail hour. We spot the first of the purple grapes, enthusiastically sampled. Grow what you like to eat. The family tried to grow broccoli without much success; since Leigh’s not a huge fan of this cruciferous veggie, they moved on to other greens. Stagger plantings & choose different tree types so everything doesn’t ripen at once. They chose two apple varieties that are ready to pick at either end of the season. Pick up tips on companion planting. For instance, plant thyme next to cabbage, nasturtiums near pumpkins, or marigolds and basil by tomatoes to protect crops from pests. Plant varieties you can’t easily (and more cheaply) find at the farmers’ market or grocery store. The couple skipped common apple choices like fuji and granny smith in favor of sierra beauty and carolina red june trees of antiquity. 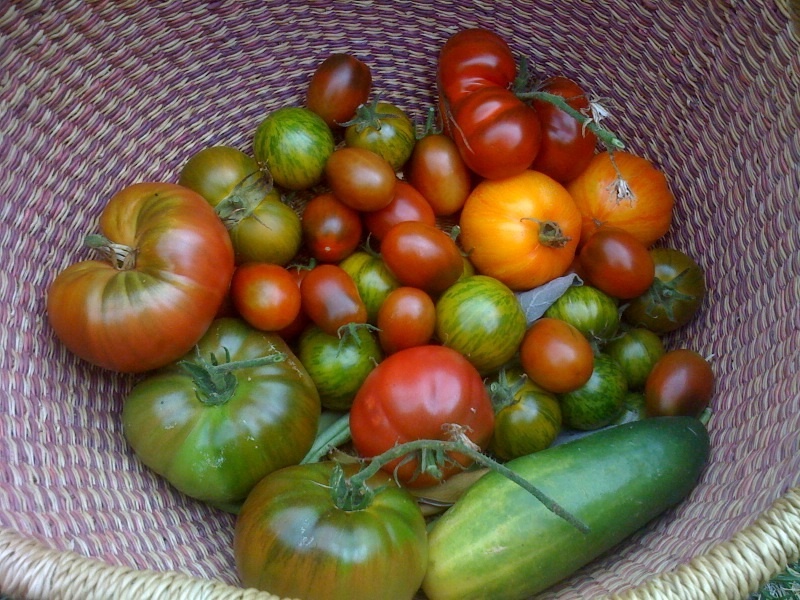 Check seed catalogs for heirloom varieties. 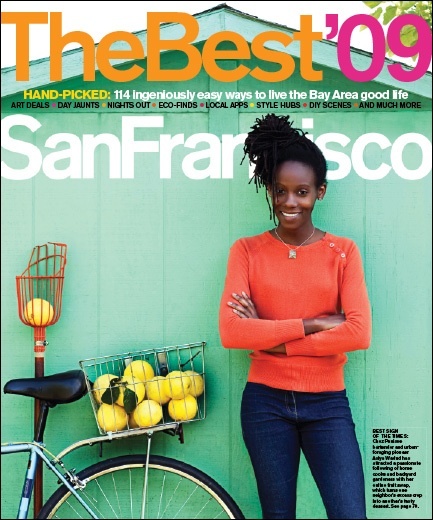 The Lemon Lady provides a list of free seed catalogs. Look for resources in your community. Here’s just a sampling of what’s on offer locally: Berkeley residents can pick up free compost courtesy of the city on the last Friday of every month from February-October, buy soil and soil amendments at American Soil, and get advice, plants, and seedlings at the Spiral Gardens Community Food Security Project. San Francisco dwellers can learn about growing food in classes and demos at Garden for the Environment. Low-income residents in West Oakland can get help tending their own backyard vegetable plot by contacting City Slicker Farms. And folks can also sign up for the uber-popular classes in gardening, beekeeping and more at the Institute of Urban Homesteading in Oakland or BioFuel Oasis in Berkeley. Don’t have anywhere to plant where you live? 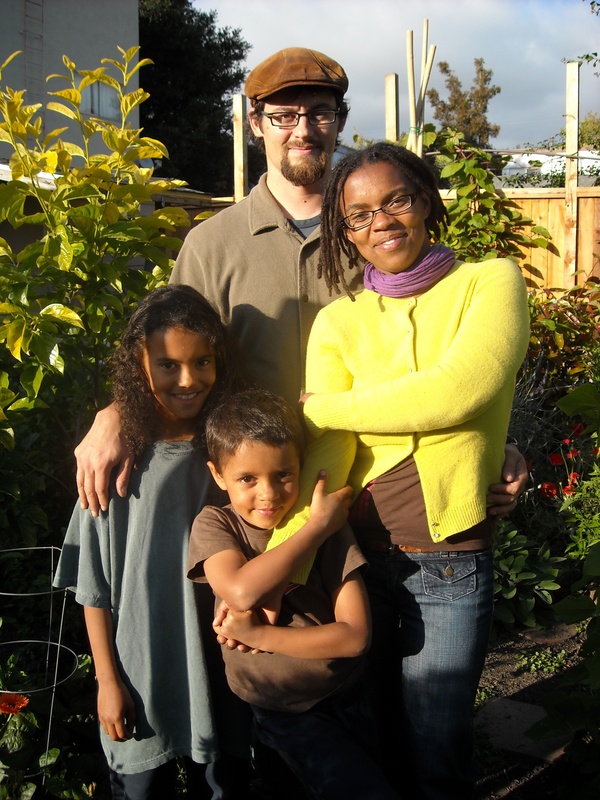 Click here to read about how one Oakland gardener traded labor for land and fed two families in the process. Find other ways to outsource establishing your own food plot in the East Bay in this recent Diablo magazine story. And if you’re already growing your own, find tips to get more food from your garden this winter or next spring in this Oregonian article. I learned this summer just how satisfying it is to go out the back door and pick your dinner (or at least some of it). So I’m thinking it’s time to get some dinosaur kale (natch), collards, and fava beans in the ground. Photo by Flickr user mbgrigby used under the Creative Commons license. So it’s orientation time for the sixth graders, a sweet and chatty bunch, at the Edible Schoolyard in Berkeley, where I volunteer each week. Last Friday, head kitchen teacher Esther Cook (yes, Ms. Cook is her real name) began by engaging the students in a food memory exercise. As we mingled around the tables the talk turned to unusual fruits or vegetables we’ve tasted and one of the girls mentioned persimmons. I resisted the urge to make a face. The very same day The Lemon Lady suggested a post on this seasonal fruit and I laughed to myself because, dear readers, I have a little persimmon problem. Perhaps one of the biggest produce pushers on the planet, I don’t much care for this prolific fall fruit. In my kitchen, right near the beloved Wedgewood, hangs this gorgeous image of persimmons by my talented friend, artist Emily Payne. I adore the print, and yet if I had to pick a fruit to munch on, persimmons would never make it on the list. Until now. Esther joked that maybe I’d never eaten a persimmon at “just the right minute.” So, with that in mind, I decided it was time to get over my persimmon phobia. I welcome all and any assistance in this matter. I suspect my first mistake is not eating this fruit at, well, just the right minute. 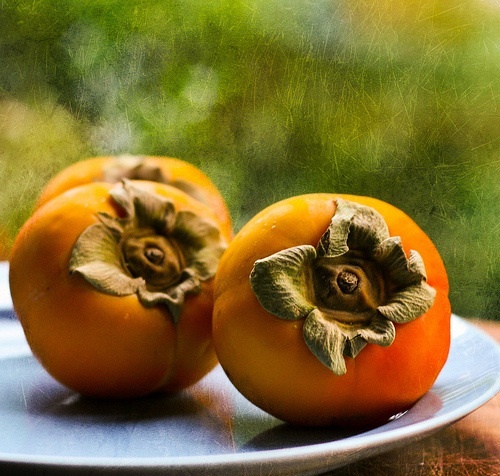 Known to ancient Greeks as the fruit of the gods, two varieties of persimmons are commonly available in the U.S. Hachiya, originally from China, are bright orange globes that taste awfully astringent when not fully ripe, due to the high levels of tannin in the fruit. They absolutely need to be soft and squishy before you even think about biting into one or you’ll pucker up and the bitterness could put you off persimmons for life. Trust me on this one. A ripe Hachiya should feel a little like a water balloon, I’m told. Use the fruit within a few days, at most, of prime ripeness or the pulp will get too mushy. Okay, so this is a high maintenance kind of fruit; vigilance is called for. Got that? (Conversely, if you want to speed up the ripening process, put a persimmon in a bag with an apple or banana. 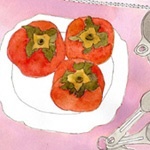 Or freeze for 24 hours and then use as you would a perfectly ripe persimmon.) When properly ripe, persimmon has been described as apricot-like, plum, or even pumpkin-esque in taste. The sweet pulp from ripe Hachiya persimmons is best used as a puree in cookies, cakes, and puddings. The other kind of common persimmon Fuyu, are squatter, more tomato-like in appearance and a duller orange in color. This variety is supposed to be eaten when firm and crunchy, much like an apple, peeling and slicing recommended, but optional. First grown in Japan, Fuyu work well in salads, where they add crispness to the mix. Both kinds are a good source of vitamins A & C and loaded with fiber. During a quick spin around my friendly neighborhood farmers’ market I find the folks at Blossom Bluff Orchards, who seem super persimmon savvy. I especially appreciate the warning sign in front of the bins of Hachiyas. With the vendor’s help, I select a large, firm, blemish-free Hachiya that should be ready to eat in a couple of weeks. Stay tuned. The two giant Fuyu persimmons I pick are good to go now, although a gaggle of shoppers agree that if they’re just a tad on the soft side you’re rewarded with a little more sweetness. I sampled some and while I’d still prefer an apple or pear I can appreciate how they’d add a nice crunch to a green salad. So one variety back on the will-eat list. Anyone out there care to weigh in on other ways to enjoy this produce? I’ve been waxing on a lot lately in this space about food films and food books. And I’ve been digging doing blogs about resourceful residents who grow and forage in the urban jungle. But it’s time to talk about cooking again. The weather has turned positively balmy in Berkeley this week and we’re heading into the lazy days of summer (for some) so it seems a good time to reintroduce recipes into the rotation, don’t you think? Let’s start with dessert and dish about some of the great-tasting fruit in farmers’ markets right now. I was also covered in flea bites from a trip to a public pool. (Word to the wise: When swimming at an unfamiliar spot dry off on the concrete and avoid the green stuff, no matter how inviting it may look. Scratch. scratch. Word to local readers: Stay off the grass at Temescal Pool.) What better way to beat the blues than to bake a cake with your sweet son who does not, thank you very much, want to go to the beach, the samurai exhibit, or the pool? Gabe sourced the blueberries from Lance & Nancy’s bushes next door and plucked a couple of Meyer lemons off our tree and away we went. My son thinks a bundt tin is a cool contraption and loves watching what happens when you pour buttermilk into the mix. He was chuffed with the end result — remember, I’m a card-carrying member of the baking-challenged brigade. The cake was a hit at the party and the leftovers got scoffed up the following day by Gabe, his buddy Griffin, and sister Nora, who were ravenous after running around at soccer camp all day. A soccer camp, mind you, that serves mostly organic, healthy lunches and snacks. How fantastic is that??? We’re also a bit partial to a fruit crumble, crisp, or cobbler in my house — my standby recipes for crisp or cobbler come from Deborah Madison’s Vegetarian Cooking for Everyone. We use whatever fruit combo we happen to have on hand. Nectarines and blueberries are swell together, as in this Blueberry and Nectarine Cobbler from Nicole at Baking Bites. Or try this Nectarine and Peach Cobbler from Elise at Simply Recipes. Or this Plum and Peach Crisp from 101 Cookbooks, which goes easy on both the sugar and butter and includes yogurt to keep things moist. My friend Marge, channeling her inner Martha, excelled last week at a scrumptious crumble with strawberries, rhubarb, orange rind and juice, sliced almonds, and oats, among other ingredients. Maybe if we beg her she’ll post the recipe here. We ate at her place while we played the board game Apples to Apples. But alas, no camera in tow to record this delectable dessert — the kind that almost gets eaten in one sitting but there’s just enough left over for brekkie — in bed! — the next day. Play hard. Eat well. Don’t forget the cream. 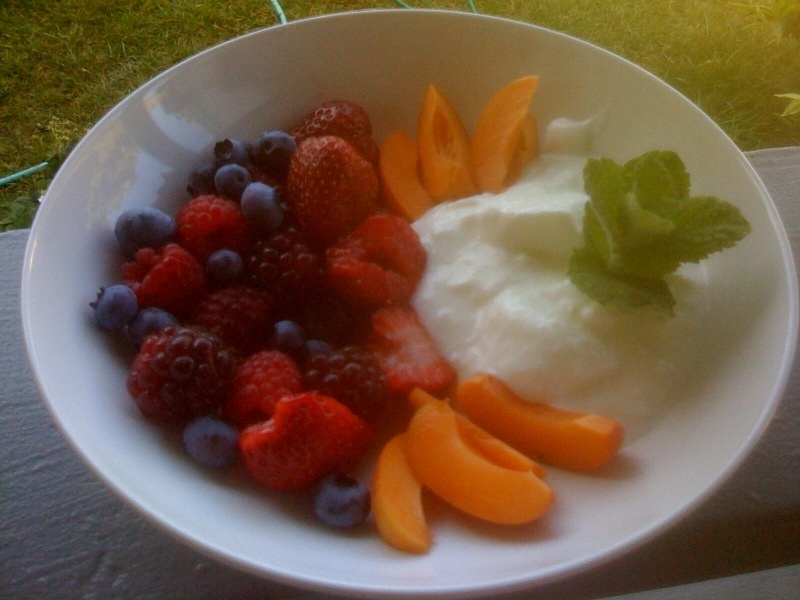 Here’s my list to get you jazzed about whipping up something fruitful some time this summer. And do share the wealth, fellow fruit lovers. I wanna know: What’s on your dessert menu? Recipe from Cooking Light. 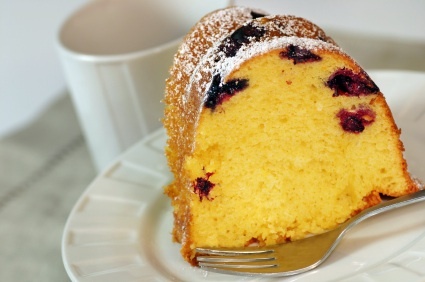 Garnish with fresh blueberries and ribbons of lemon rind. Especially appealing for afternoon tea with a cuppa. Recipe from Deb at Smitten Kitchen or try this version Rhubarb Strawberry Crumble from Eating Well. Either way, serve with lashings of cream laced with vanilla essence. Recipe from Margaret to come (no pressure my friend;). The pav recipe I routinely turn to is in Sydney Food by Bill Granger. My sister, Amanda, and sister-in-law, Alice, also make to-die-for versions. But between them, Mand and Ali have seven kids, demanding jobs/lives, and they’re not too sure about this blogging business so you’ll just have to take my son’s word for it: Their pavlovas rock. Regardless of whether this dish actually harkens from Australia or New Zealand it’s a Down Under delight. The version here, from Stephanie at Joy of Baking, looks pretty darn delish. Plus the girl has created a chocolate pavlova. Oh my! What could be simpler or more scrumptious than a baked peach? My sis-in-law, the aforementioned Alice, dots the top of each peach half with butter and brown sugar. In the version here, Jamie Oliver stuffs ’em with raspberries. Works wonderfully with vanilla ice cream and caramel sauce, also found in Sydney Food. Apartment Therapy’s the kitchn offers a grilled version, topped with bourbon vanilla whipped cream, for you outside cooks. Refreshing. Easy. Fast. Say no more — other than you do need an ice-cream maker. This version comes from Tori at Tuesday Recipe. We’ve all done it, yelled: “Grab a bar & a bottle” as we bolt out the door. It’s tricky figuring out a healthy, on-the-go snack for our kids in a hurry. So it was my turn on the Saturday sport snack schedule a week ago. I’ve pretty much figured out the food end of it. Cut fruit, whole-wheat crackers, and chunks of cheese usually does the job. But I’m challenged in the beverage department. Have you studied a drink bottle label recently? Here’s a handy hint on label reading: Listing sugar in grams doesn’t mean much to me, other than more is obviously not good. But this is a measure I can visualize: Just divide the # of grams by four to find out the sugar content in teaspoons. Before snack duty day I loaded up the cart with fruit-juice-only drinks, vitamin waters, and other (it turns out) sugar-filled beverages. One brand popular among health-conscious types boasts that it’s 70 percent juice. It also contains a whopping 43 grams of the sweet stuff in one of its 12-ounce bottles. 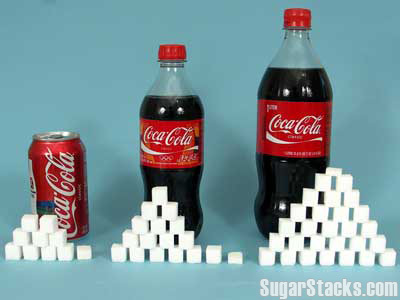 We’re talking 11 teaspoons of sugar. Yikes. And those vitamin waters — which contain no fruit juice but sometimes do have caffeine so double check those labels — are high in sugar too. Now I’ve become an obsessive label reader. I’m not a zealot. I get that the occasional treat is fun. I can still recall ordering pink lemonades with my grandparents in suburban Sydney. Unlike American lemonade, these concoctions were a soda more akin to a 7-Up with a dash of bright pink grenadine for a festive effect. Loved ’em. Only got ’em once in a while. What about plain old water? Yes, my kid has his own reusable water bottle. But you try showing up with bottled water in the Bay Area. It’s a political hot potato. So I tried a little experiment. Along with the regular “crap snack drinks” as my son and I call them, I sent two big pitchers of water with citrus slices and homegrown mint to practice; not a drop came home. Next time: I’ll forgo the packaged drinks for the gently flavored H20. Choice isn’t always a good thing. Feel free to share other on-the-go drink (or snack) ideas. At home, there’s a drink we can offer our kids without guilt. The humble smoothie is a simply delicious way to quench thirst, supply energy, and get some nutrition into the mix as well. Cheers. Smoothies make a great snack or a quick breakfast. 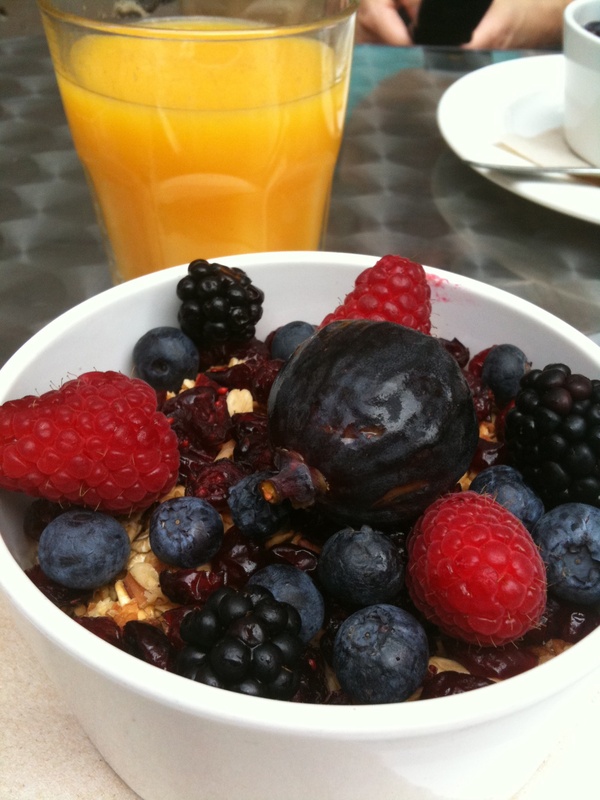 Vary the fruit or fruit juice depending on taste. Blueberries, for instance, make for a cool-looking concoction. 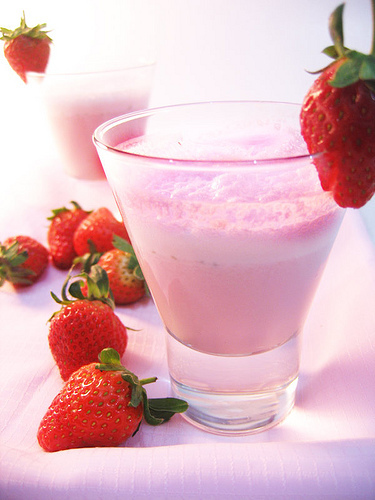 Substitute vanilla rice, soy, or cow’s milk for juice and/or yogurt. Use measurements below as a guide. The consistency of a smoothie can be custom made to suit personal preference. Quick Tip: Frozen fruit such as berries, bananas, mango, or pineapple makes a thicker, frothier smoothie and ensures it’s a refreshing ice-cold drink to boot. 2. Pour into chilled glasses and serve.